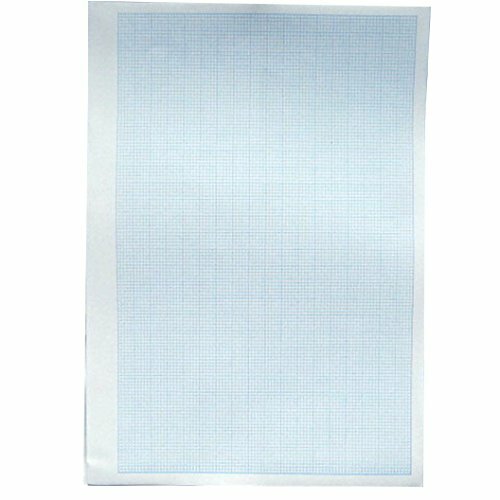 This good quality graph paper comes in a ream of 500 individual sheets. Each sheet is printed both sides giving the opportunity to produce 1000 graphs. Finished size is 297mm x 210mm with each sheet being printed both sides with a light blue background and individual dark 2mm graph squares on an 80gsm white offset. The left hand long edge (297mm) also includes a larger margin of 20mm so it can be punched and placed in a ringer binder without going into the graph. Great for school, projects, home or work use. This good quality graph paper comes in a ream of 500 individual sheets. Each sheet is printed both sides giving the opportunity to produce 1000 graphs. Finished size is 297mm x 210mm with each sheet being printed both sides with a light blue background and individual dark 2mm graph squares on an 80gsm white offset. The left hand long edge (297mm) also includes a larger margin of 20mm so it can be punched and placed in a ringer binder without going into the graph. Great for school, projects, home or work use. If you have any questions about this product by Paper Things, contact us by completing and submitting the form below. If you are looking for a specif part number, please include it with your message.